There is a store called Mint Store here in Saint Petersburg. It’s a men’s fashion/casual/street store representing brands like WoodWood, HAN KJOBENHAVN, The North Face, NIKE, Stone Island and others. 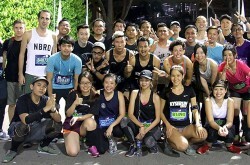 Mint Running Club was founded by the guys from Mint Store, who wanted to run together with their friends. After a few closed runs we began to invite more friends and everyone who wanted to join. 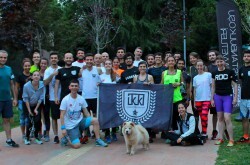 So the concept was not a serious sport club, but a group of friends, interested not only in running. We share interests also in music, fashion, design, parties and all this stuff. 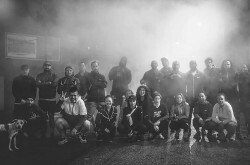 We represent running as a part of street culture like skateboarding or graffiti. We have about 20 core members. 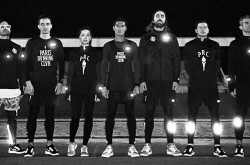 Everyone else who can run at least 5-7k is always welcome to join us. But we wish that you share similar vision on the whole street running, partying and BTG movement to become part of the crew. Our captain is Grigori, he’s been running with the crew since the day one and co-captain is Max, who joined a little bit later.